Here and there. Sort of doing that "can't stay in one spot for long" thing that's been the staple of my last few summers. Landed here at home for now and recovering from a (hopefully) minor throat thing. It's hot, it's muggy, and I don't really have much to say. My life's changing and I need a rock polisher. And a detailed strat column. And a place where I can go hiking!!!! I suppose I should resurrect this thing! -Commuting between GB and EL to tie up the big loose ends in my research, create my AGU poster, a vector map of my study area, and find what is apparently the ONE garnet in all of my thin section samples. -Photomicrographs and petrography and discussion of metasomatism, oh my. Woo. And tomorrow: MOVING to Champaign! This should be interesting. 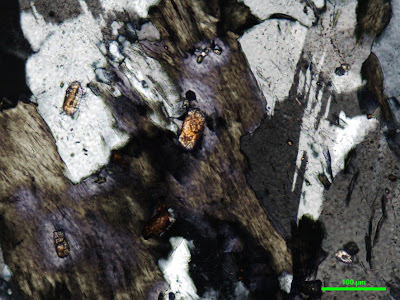 The scale bar is 100 micrometers long, and this is a shot of zircons embedded in alkali feldspar, quartz, and suspected "amphibole" (we're not sure yet; might specifically be actinolite) crystals. The zircons are the small, brightly-colored, semi-rectangular crystals. The "amphiboles" are the green/brown, furry-looking crystals; the alkali feldspars are the black-and-white crystals with the jagged lineations; and the quartz is the amorphous white stuff. There's a strange reaction rim around the zircons embedded in the amphibole that we need to look at a bit more, so don't ask me about that. Seeing those in the thin sections means that we can extract zircons from the kilogram of aplite I have crushed up and sitting in a bag, once we process the sample a bit more. With the extracted zircons, we can mount them on a disc and zap 'em with a laser, creating a small cloud of melted zircon, containing such elements as Zr, U, Th, Pb, and Si, among other things. The relative proportions of the radioactive/radiogenic elements will allow us to extract an approximate age from the zircons that is hopefully representative of the age of crystallization of the rock. Cool stuff. This is what I'm doing with my summer vacation - exactly what I was doing during the year, without the whole going to class business.